Doesn’t the air smell wonderfully fresh after a new rain following weeks of dry weather? That’s called petrichor, and I filled my lungs with it this morning after hearing the welcome sounds of rain on the roof overnight. We didn’t get enough moisture to make much difference to the parched soil and dry moss, but maybe the mycelia below soil level were also heartened by the promise of the rainy season’s return. 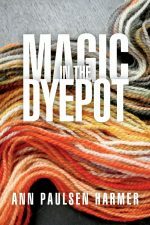 Now I’m spinning up what bits of yarn are left from last year’s dyepots, and finally decided to do something with the Pycnoporellus roving I showed in my previous post. 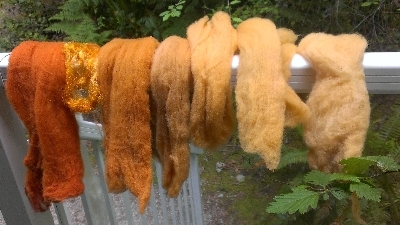 I needed to pop up the colour a bit, so decided to use a bright piece of wool that came out of a Cortinarius cinnamomeus dyepot, along with a vibrant chunk of synthetic fibre that went through the dyebath at the same time (the two sections on the far left). 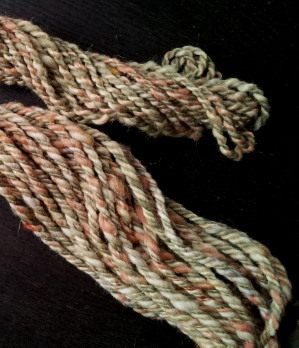 It didn’t take much time to run it all through my handcarders, then I spun two strands of thick-and-thin, to give the skein some texture. I normally don’t like orange—probably because I can’t wear anything resembling that colour—but blending it with the warm peach resulted in another skein I love to fondle. Now I’ll take any amount of petrichor that wants to come our way, as long as it means some real rain in the near future. So many learning experiences, all of them valuable. This coil yarn emerged from a dyepot of lobster mushrooms (Hypomyces lactifluorum) a lovely strong orange, just what I wanted for my next experiment: I planned to “highlight” each individual coil with a washing soda solution, which turns the orange into a shade of magenta. Wouldn’t that be striking, I thought—orange yarn with evenly spaced magenta coils. I towel-dried the yarn as soon as it had cooled and set about painting each coil with a tiny brush dipped in the soda solution. And the results were immediate: magenta coils strung together by an orange yarn. But there was one thing I hadn’t taken into account. A solution painted onto wet fibre will bleed into said fibre—the wicking principle. 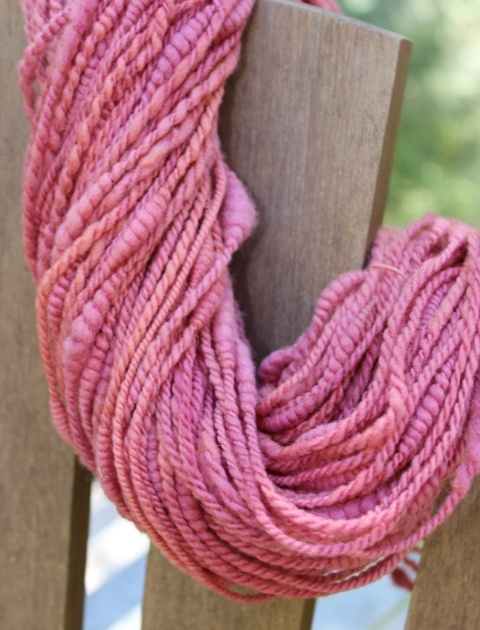 So when I returned to my studio the next day to admire my results, I was greeted by a beautiful almost-entirely-magenta yarn, punctuated here and there by a few orange strands. Oh, well . . . that gives me an excuse to spin another coiled yarn and try all over again. 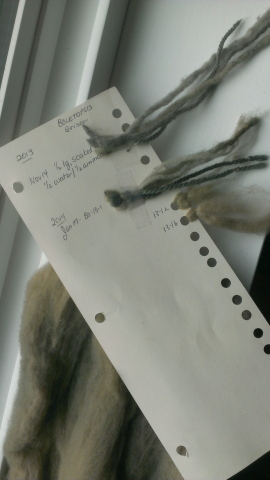 Every aspect of mushroom dyeing and fibre preparation is a joy, and I could always use more time at these pursuits, but the ultimate pleasure, the end goal of all of this, is the spinning. I love to feel the smooth fibres slipping through my fingers as the wheel works its magic and twists them into a thread that winds onto the bobbin. 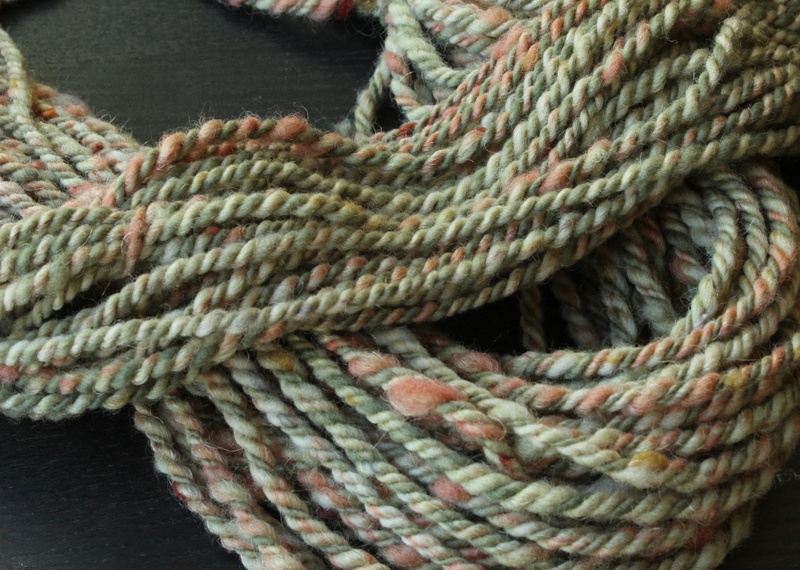 If I’ve blended colours or fibres, it’s exciting to see how they come together into a single strand, and then how plying two or more strands results in a balanced yarn. As I wind the yarn onto my niddy-noddy, the length of it again slides through my hands, and when I’ve tied it into a skein, I get to fondle it once more. 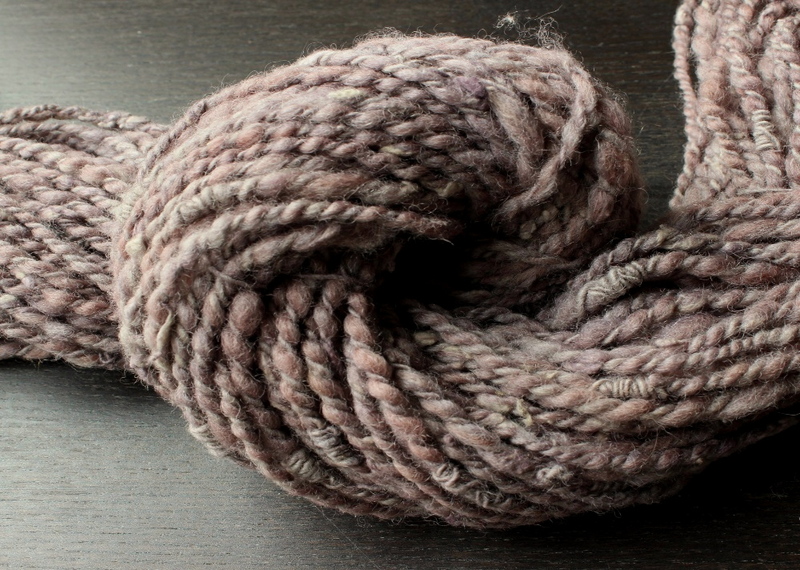 Who knew yarn could be so tactile, so sensual? 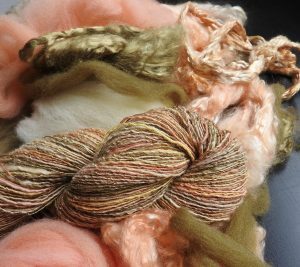 This yarn was the result of carding some blah colours into batts, which I then brightened up with some leftover bits of orange and gold. I spun this deliberately chunky and used two plies of this with one ply of straight Hydnellum green—the result ended up not blah at all. When I ran out of one strand of the chunky, I plied the other with what was left of the green; hence the smaller, greener skein that sits on top. 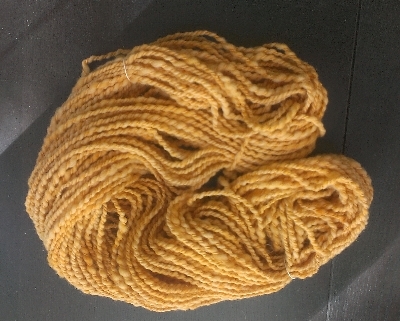 I love this colour, and until I fire up a few more dermocybe dyepots, this is all I have of it. I added texture by”stacking” a thin ply over the soft texture of a thick-and-thin ply. 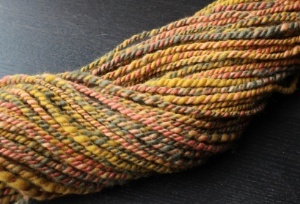 I made this yarn from the results of several Phaeolus dyepots, combining shades of gold and green. The “icicle,” a synthetic product, picks up colours wonderfully and adds a bit of zing to the finished yarn. I had fun with these skeins. 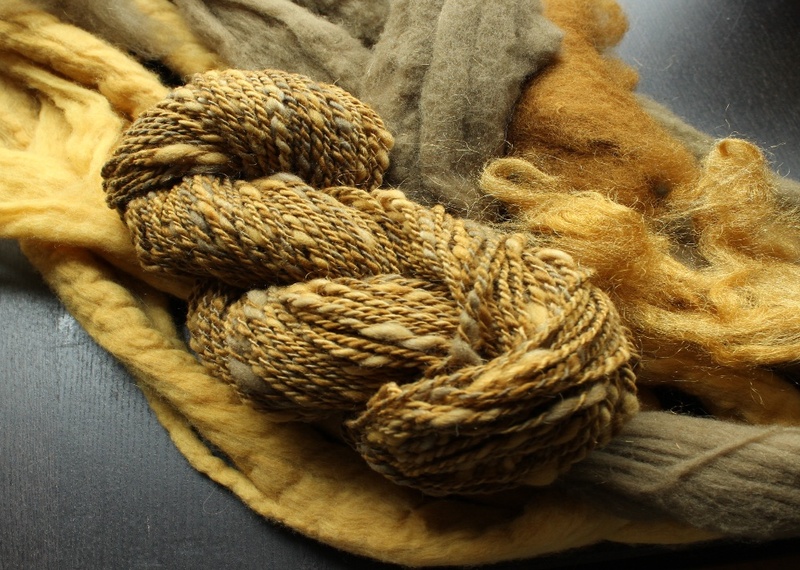 I spun them from a soft white roving, my reliably go-to fibre, then dipped parts of them in each of three dyepots: dyer’s polypore (Phaeolus schweinitzii), lobster (Hypomyces lactifluorum), and Hydnellum aurantiacum. The colours overlapped quite nicely. Now my spinning wheel is calling me. Or rather, out with it, damn Squirrel—where did you stash all my Boletopsis? Only once in the last six years did I see a Boletopsis: a mushy blob another dyer had found and frozen in a glass jar. But I saw the beautiful colour resulting from its dyepot, so I resolved to find one of my own someday. That day took a long time to arrive. Last fall, a record mushroom season in this area, a fellow SHROOMer found a couple of Boletopsis grisea on one of our club forays. He didn’t recognize it, and it didn’t take much convincing for him to decide he didn’t want to eat it (technically they’re edible, but apparently they’re very bitter). I took the mushrooms back to my studio and soaked them in a 50:50 water/ammonia solution, which resulted, after cooking, in some lovely sage-y green samples. So imagine my delight when I came upon a mass of these mushrooms a few weeks later! Actually, it was my dearest who found them, and it took me several minutes to scramble through the mossy windfall to their location—I could tell by the excitement in his voice that it had to be something worth scrambling for. Once again, I was beside myself with joy at the mushroom’s capability of producing in huge abundance . . . not every year, necessarily, and not every mushroom, but when conditions are right, fecundity is the word. I harvested carefully and with gratitude, then took them home to dry. Ordinarily these fungi would have hit the dyepot the next day, but did I mention that 2013 was a particularly amazing year for mushrooms? We were out in the forest every day, coming home with piles and piles of fungal beauties, so I had no choice but to spread them out to dry on my studio floor while I was out gathering more . . . and more . . . and more. I ran out of floor space, so I started laying mushrooms out in the space underneath my studio: a latticed enclosure on a fairly steep slope. I can stand at the lower end, but have to stoop to get to the upper end. The mushrooms found this space to their liking and began to dry quite nicely. The season done, I was ready to fire up the dyepots, and of course I wanted to see what colour all of these Boletopsis would give me. I went down to get the cardboard tray they’d been drying on, only to find it mostly empty! What?! In disbelief, I poked around among the crates and boxes occupying most of the under-studio space, and found some other dried mushrooms (Phaeolus schweinitzii and Hydnellum aurantiacum) had been scattered haphazardly around the space. But no Boletopsis . . . I can only assume that the squirrels sensed their edibility and squirreled them away, as is their wont, to nosh on over the winter. And we have seen some very chubby squirrels around the property this spring. They did leave me with a few, though, and these gave me a really wonderful green, enough for one of the plies in a three-ply chunky yarn, with what was left going into a smaller skein of two-ply. I live in the forest. I am happy to share with the forest. Squirrels are creatures of the forest. Damn them. Early on in my mushroom dyeing [buzzword alert] “journey,” I did all of my experiments with commercial yarn, as I wanted to see how many different colours I could obtain in one season. I played with random combinations of three different colours; no matter which colours I put side by side, they always went well together. (I posted about this on January 19, 2011, and again on January 24). Now I’m playing with colours again, this time in my handspun yarns. In this case, I blended three stripes on my drumcarder, putting them through once. 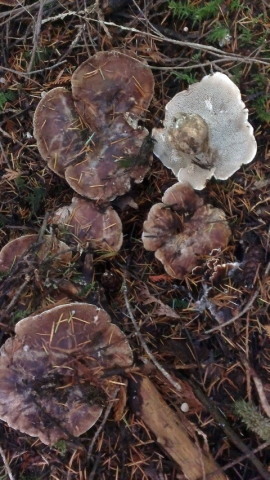 (The colours came from Phaeolus schweinitzii, Tapinella atrotomentosa, and dermocybe dyepots.) 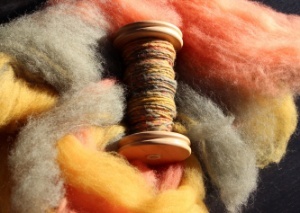 Then I drafted the entire batt into a roving the right size for spinning. The colours remained as separate stripes in the roving and into the yarn. 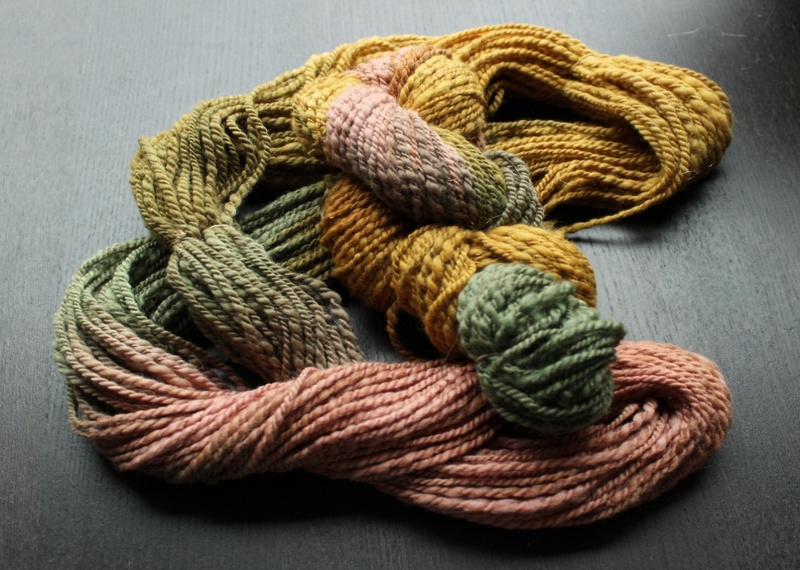 Proving once again that mushroom dyes sit well together. 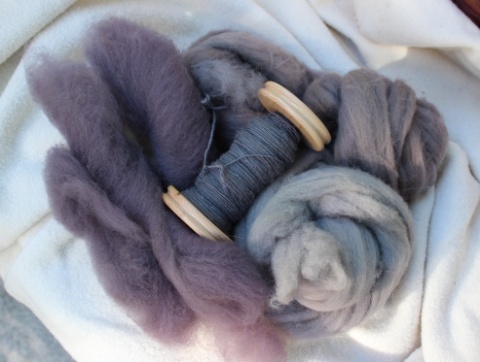 I haven’t yet rinsed any of this dyed wool—I’ll spin them first, then set colour and twist at the same time. I’ve taken each piece of dyed roving and divided it in half, spinning from darkest to lightest (the colours each successive exhaust dyepot gave me). I’ll spin two bobbins in this way, then ply them together, with the end result being one yarn that starts with the lovely dark violet and ends with the lightest purple-grey. In time, I’ll turn this into a scarf or a shawl, depending upon how much I end up with.